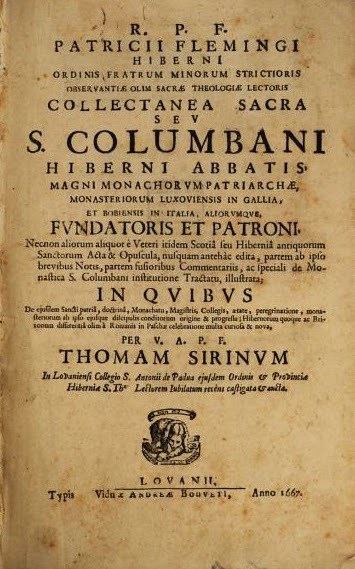 Alexander O’Hara in his excellent translation and study of Jonas of Bobbio’s Vita Columbani notes that this seventh century account of the wandering Irish pilgrim Columbanus opens with a citation from the earliest poem about Ireland, the Carmen de Hiberniae insula. Jonas was not the author of this poem, rather it was written by an Irishman most probably a disciple of Columbanus in the late sixth or early seventh century. We can tell that the poem is of Irish provenance because of the poem’s peculiar style of Latin, namely the flamboyant style employed by Irish monks and known to scholars as Hisperic Latin. In addition the poem refers to the western coast of Ireland as something known first-hand to the author. This is certainly not true of Jonas of Bobbio, an Italian monk who never visited Ireland. So where did Jonas come across this poem? Jonas was a monk in the Irish monastery at Bobbio in northern Italy, a monastery established by Columbanus in 614. 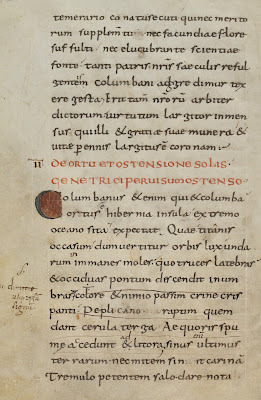 Jonas entered the monastery shortly after Columbanus’ death in 615, and as O’Hara notes, he was “influenced by his monastic formation at Bobbio, where he would have come into contact with Columbanus’s Irish monks, who had travelled with the saint following their expulsion from Burgundy in 610. In a multi-ethnic community such as Bobbio the Irish members of the community could voice their own perception of their island home as opposed to the liminal and pejorative views of classical ethnographers” (O’Hara, 308). Classical geographers and their successors in late antiquity generally had very little to say about Ireland, and what they did say was usually negative, tales of cannibalism and barbarism etc. What stands out in the Carmen de Hiberniae insula is that the poet has nothing to say about his fellow Irishmen and women, its the island itself, the land of his birth, its climate and her ocean view that he seeks to describe and remember. His theme is the rugged Atlantic seaboard, the wild Atlantic way if you will. The poet knows the western coast of Ireland well, which may suggest he was from the west of Ireland. Could he even have been a Clare man? His Ireland lies at the end of the world, battered by monster waves and ocean swells. A land of the setting sun. Coming from Ireland to the European mainland in the early medieval period was in the words of Columbanus “coming from the world’s end” (de extremo mundo) (Ep. 5.7). Columbanus himself could also wax lyrical about Ireland as the edge of the inhabited world, an island on the periphery but still within God's plan of salvation. In his letter to Pope Boniface in 613 he described the Gospel's first arrival to Ireland as coming on the chariot of God which came racing over the seas from Rome “over the dolphin’s backs over the swelling flood, [and] reached even unto us” (Ep. 5.11). Here Columbanus was probably referring to Rome sending Palladius to Ireland as its first bishop in 431 (years before St. Patrick later came on the scene). In chiding Pope Boniface for his failure to lead the Church and his divergence from orthodoxy - as Columbanus understood it - he employed metaphors of the ocean and its waves breaking over the swamped curragh that is the Church. In the mind of Columbanus the crisis of the Tri-Capitoline Schism that he waded into in northern Italy was no rogue wave, it was a full blown tempest. “Watch, for the sea is stormy and whipped up by fatal blasts, for it is not a solitary threatening wave such as, even across a silent ocean, is raised to overweening heights from the ever-foaming eddies of a hollow rock, though it swells from afar, and drives the sails before it while Death walks the waves, but it is a tempest of the entire element, surging indeed and swollen upon every side, that threatens shipwreck of the mystic vessel… For all we Irish, inhabitants of the world's edge, are disciples of Saints Peter and Paul and of all the disciples who wrote the sacred canon by the Holy Ghost, and we accept nothing outside the evangelical and apostolic teaching” (Ep. 5.2). and light descends into the sea in the western shadows. and do not allow the coast that we know well to release a small questing boat into the salt-swell. with dimmed light wheeling, heads for the regions of [the star] Arcturus. Jonas of Bobbio: Life of Columbanus, Life of John of Réomé, and Life of Vedast. Alexander O'Hara and Ian Wood. Liverpool University Press, 2017. The medieval Irish monastery's role in preserving native Irish literature has been well documented. It should be remembered, however, that not every scribe was impressed with the content they had to copy. Among the greatest of the medieval Irish sagas that was preserved on parchment was the Táin Bó Cúailnge (The Cattle Raid of Cooley). This epic tale was passed on as part of a bardic oral tradition before it was redacted, compiled and written down in the twelfth century. Its textual history is complex and three recensions survive in different manuscripts. 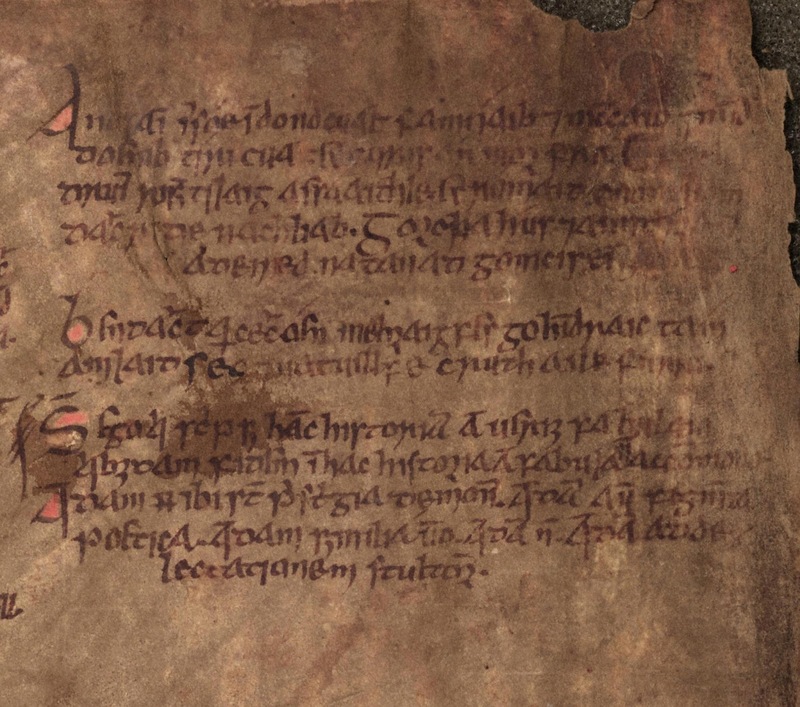 According to the Irish tale Do faillsigud Tána bó Cúailnge (‘How (the) Táin bó Cúailnge was found’) the best striving manuscript of the Táin was pawned off by a monk for a copy of one of Isidore of Seville's works. Only then was it discovered that no-one could remember the Táin in its entirety. 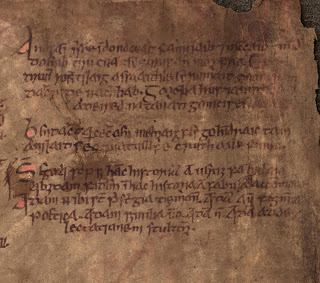 In the Book of Leinster there is an interesting scribal colophon at the end of its own peculiar recension of the Táin Bó Cúailnge. "But I who have copied this history or, more accurately, fable, do not give credence to certain things in this history or fable. For certain things in it are the illusions of demons; certain are poetic fictions; certain are plausible, certain are not; certain are for the entertainment of fools." Professor Pádraig Ó Néill offered some reflections on "the rather complex reactions of a twelfth-century Irish ecclesiastic to his native literature." 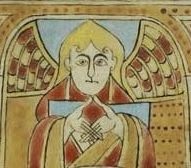 The cantankerous scribe in question was likely, according to O'Neill, magister of a scriptorium or fer légind of a monastic school. Such criticism of Irish literature in the Medieval era was by no means limited to the Irish themselves. 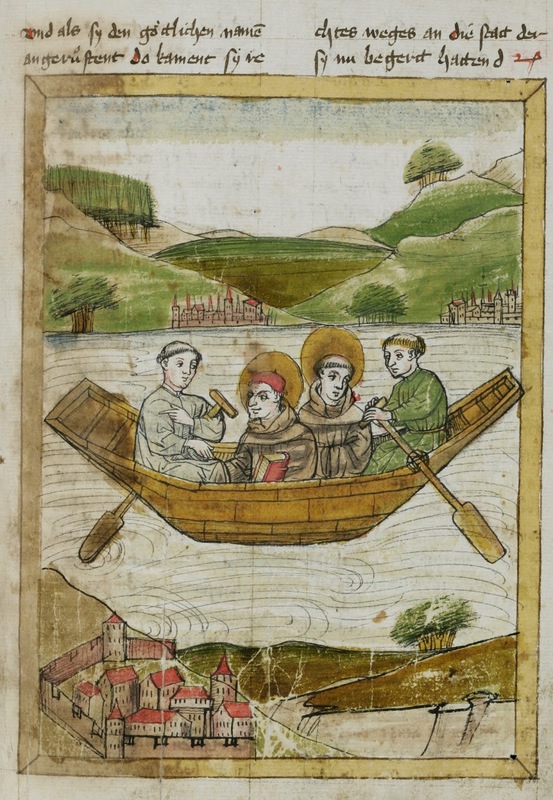 An English scribe who copied out the Irish account of Saint Brendan the Navigator finished off his manuscript with the verdict that "it is not true, nor [even] probable. . . [and] these fabulous tales ought to be consigned to the fire." 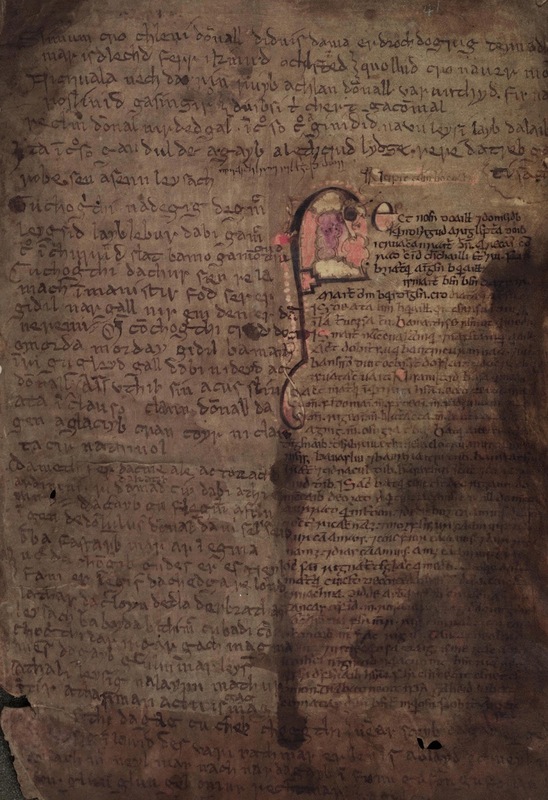 For O'Neill the Irish scribe's poor review of the Táin "betrays a new, critical, attitude towards native Irish literature, one which presages the end of the compact between the two learned classes of native filid and monastic literati... The explanation for this change almost certainly is to be sought in the ecclesiastical reforms, especially the introduction of foreign religious orders, which were being effected in the Irish Church during the second half of the twelfth century." Pádraig Ó Néill, “The Latin colophon to the Táin bó Cúailnge in the Book of Leinster: a critical view of Old Irish literature”, Celtica 23 (1999): 269–275. Ernst Windisch, Die altirische Heldensage Táin Bó Cúalnge nach dem Buch von Leinster - Leipzig 1905. [Christmas] It is called the Lord’s birthday when the wisdom of God presented itself to us as an infant, and the Word of God without words uttered the flesh as its voice. Let us joyfully celebrate the coming of our salvation and redemption. … For whose benefit did such sublimity come in such humility? Certainly for not of his own; but, if we are believers, totally for ours. Wake up, mankind, for your God became man! …. Hence, when the Lord whose birthday we are celebrating today was born of the Virgin, the announcement of the angelic choir was made in the words: 'Glory to God in the highest, and on earth peace among men of good will.' (Luke 2.14) How can peace exist on earth unless it be because 'truth is sprung out of the earth,' (Psalm 81.11) that is, because Christ has been born in the flesh? Moreover, 'He Himself is our peace, he it is who has made both one' (Eph. 2.14) so that we might become men of good will, bound together by the pleasing fetters of unity. … Let us then rejoice in this grace, so that our glorying may bear witness to our good conscience by which we glory, not in ourselves, but in the Lord. That is why Scripture says: He is my glory, the one who lifts up my head (Psalm 3.4). For what greater grace could God have made to dawn on us than to make his only Son become the son of man, so that a son of man might in his turn become a son of God? Ask if this were merited; ask for its reason, for its justification, and see whether you will find any other answer but sheer grace. The incident of Adam and Eve eating the forbidden fruit from the Tree of the Knowledge of Good and Evil has long fascinated readers of the Bible. Many scholars in late antiquity and the early Middle Ages speculated concerning exactly what kind of fruit Adam and Eve ate. An interesting seventh century Irish theological work entitled "The Odering of Nature" (De Ordine Creaturarum) proposed that Adam and Eve had eaten from a fig-tree. 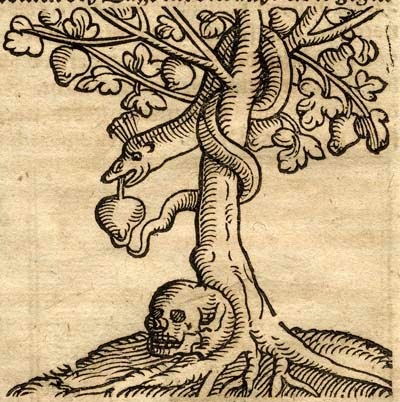 “It is not at all clear from what species of tree Adam ate, but it is clear that immediately after sinning he covered his nakedness with the leaf of a fig tree (Gen. 3.7), the only tree Jesus cursed when he was in the flesh – not long before he accepted death on account of the fault of Adam. The tree immediately withered when he said: “henceforth no fruit will ever come from you” (Matt. 21.19), that is, it could no longer harm men as it had done before. For Christ gathered in that tree, that is, in the fig tree, the curse of the sin of Adam which infected the whole earth until he cleansed it with the drops of his own blood. For the Lord would have known for sure whether the first man received his guilt from this tree or from another.” (DOC X.13-14). 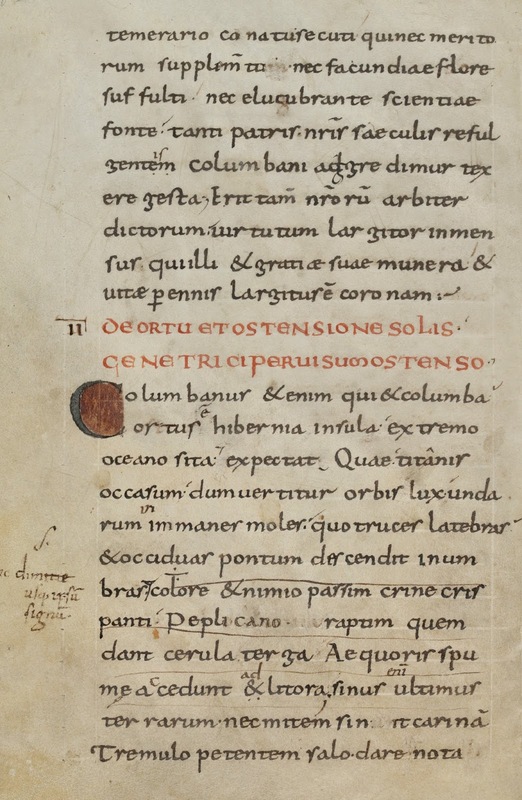 The Irish monastic leader Columbanus wrote several letters during his time in Europe (c. 598-615). These letters are some of the earliest examples of Hiberno-Latin and our only surviving source from the conservative Irish camp on the Easter dating controversy. The letters were written to three popes (Gregory the Great, Sabinian (? ), and Boniface III), a synod of Gallic bishops that wanted to censure him, and to his own monks at Luxeuil following his expulsion from Gaul. Columbanus was a man who spoke his mind and was proud of that fact (Ep. 5.9). At times he had to excuse his abrasive style on the grounds that he was Irish, and appealed to "the freedom of my country's customs, for among us it is not a man's station but his principles that matter" (Ep. 5.11). This appeal to Irish free speech emboldened him to lambaste the bishop's of Gaul and occasionally a pope or two. Fleming was later appointed director of an Irish college in Prague in 1630, but was murdered in 1631 during the Thirty Years War. His magnum opus on the life and works of Columabanus was finally printed some 36 years later. The modern critical edition of Columbanus' letters is still primarily reliant on Fleming's work. *note: There was a second 17th century transcription produced by a scholar named Joadoc Metzler, but this is very probably a transcription of Fleming's work and not from the Bobbio manuscript. See Johannes Wilhelmus Smit, Studies on the language and style of Columba the Younger (Columbanus) (Amsterdam, Hakkert, 1971), 33-8. Sedulius Scottus, (fl. 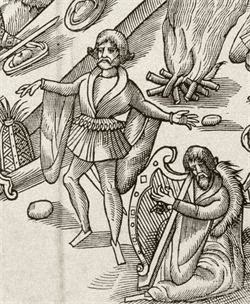 840-860) lived in Liège at a time when Irish scholarly influence in western Europe was at its zenith. He was a scribe, poet, grammarian, philosopher, and theologian; a professional wise man of sorts. In one of his poems he mentions his fellow Irish compatriots, Fegus, Blandus, Marcus, and Beuchell, as the "four-span of the Lord, [and] the glory of the Irish race" (Quadraige domini, Scottensis gloria gentis), no false modesty here. 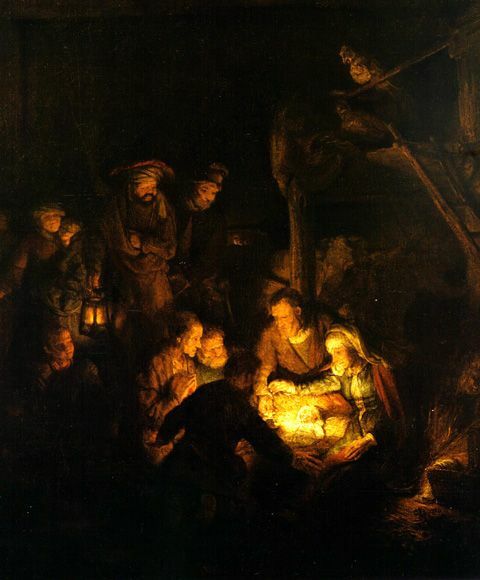 In a Christmas poem he wrote around 850 he described a Christmas celebration in Liège. The imagery of the nativity is applied to the church and her bishop. The church choir emulates the angelic hosts in their praise of God and the bishop is the shepherd who leads his flock to the true Shepherd Christ. But what of the Wise Men? Well naturally for Sedulius, the Wise Men are the Irish scholars like himself who have come to Lèige bearing gifts of wisdom and eloquence! The Messiah. the bread of life, is born in the town of Bethlehem. But here is the Lord's house, and bread too, and the nourishing drink of poor Bethlehem. When the joyous day arrives, let all rejoice as one, and let gladness and love rule every man's heart. Divine radiance attests to Christ's birth, and heaven's splendor adores our True Light. Let us walk happily in the light of Christ, and go directly to his sacred land. Amen. See Edward Doyle, Sedulius Scottus: On Christian Rulers and The Poems, Medieval & Renaissance Texts & Studies, Vol. 17 (Binghamton, NY: State University of New York, 1983), 112-113.